Buy this and your school gets €0.88 to spend on books Orders of €10 or more will earn 25% of your order value back in Scholastic Rewards for your school. A total classic. Can you rhyme it as loud as we can? It’s splashy, it’s muddy and it’s loads of fun. Don’t delay: pull on your wellies! Hurray: we’re going on a bear hunt! Through the long wavy grass, the thick oozy mud and a swirling, whirling snowstorm. But will we find a BEAR today? Get ready to run away! We always love Michael Rosen, but never more than when we’re reading this noisy, joyful delight. 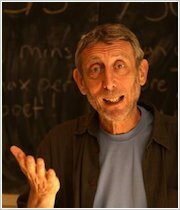 Michael Rosen was born into a London Jewish family, the son of two distinguished educators – Connie and Harold Rosen. Michael’s childhood was rich in books, stories and conversation. Michael attended Middlesex Hospital Medical School for a year but transferred to Wadham College, Oxford to study English Literature. At Oxford, he started to realise his ambition of acting (as well as writing and directing). Michael still says that if he wasn’t a poet, he’d like to be an actor. Anyone who has seen him in performance knows that he already is! The narrowness of his course of study proved a source of dissatisfaction and Michael began looking outside his recommended reading to contemporary working, class ballads. He retains a passion for street rhymes, popular songs and folk stories. He quickly made a name for himself with his collections of humorous verse and picture books for children. He is described as one of the most significant figures in contemporary children’s poetry, drawing closely on his own childhood experiences, and ‘telling it as it was’ in the ordinary language children actually use. Michael is now a poet, author and broadcaster, and was Children’s Laureate from 2007-2009. Fabulous book for young children. Fantastic for pre schoolers as phrases are repeated throughout the book. Will also help those learning to read to remember repeat words. this book is rubbish it dose not tell you iny thing about going on a bear hunt there is only sound afects and little kids will think that you think you talk like shh grr and thats not how you talk and if you think i am a old mean porson i am not the book is just rubbish. My mum read it to me when I was three, four , two and one. It is very clever liked the bit where they said were going on a bear hunt. I recommend it. My mum ALWAYS reads this book to most of the children she knows and she really likes it and thinks its a great book for children to read so 5/5 from me. I read this book when I was little and I absolutely loved It . It’s a great book for little children. This is a timeless classic which everyone, even adults, enjoy to bits! This is the type of book that once you have read it you will always remember it! I love this book its brilliant and love joining in with my mummy and saying the story as my mummy reads to me. I now know the story as ive read it so many times i love it. This book is a family favourite and will brighten up your day for any ages. A family goes on a bear hunt! But will they find a bear? Read this fun filled adventure story to find out! I remember reading this book as a small child, and I LOVED it. I definitely recommend this book to little ones. it is a brilliant book! This book still makes me feel excited to read it! One of the best children’s books I’ve read. i thought this was an amazing book. full of detail and i could place myself in the book as one of the characters. I like the bit when they go in to the cave and the part when the lady trips in the forest. I thought this book was funny when they see the bear. I still love this book even though im ten . I read it sens I was at playgroup.I fort the bear was going to eat the people but it dident. ?? ? ?? ?? they go on a bear hunt then everyone says were going on a bear hunt we’re going to catch a big one we’re not scared but they are ….. they all run home and go under the covers and they say we’re never going on a bear hunt ever again!!! This has got to be one of my family favourite books where every body joins in making the sounds of various obstacles and sometimes we don’t even get to the end because we’re all laughing. I would recommend this book for young children. good for little kids! always loved this book! What an amazing book! Perfect for all younger readers. Well worth a read, if you like rhyming books and having a laugh. This is about a family trying to catch a bear. they go on a bear hunt then everyone says were going on a bear hunt we’re going to catch a big one we’re not scared but they are …..
they all run home and go under the covers and they say we’re never going on a bear hunt ever again!!! I used to love is book when I was little, and I still do!!! I found that this book really gave me confidence reading and that not all books are boring! I love the pictures that go with it and how colourful they are so that it attracts little children. This book is without doubt for younger readers but I wouldn’t still recommend for older readers, for a but of a laugh!!! I think this is brill! But definitely for younger children. I loved this book when I was little – I remember reciting it – ‘we can’t go’ etc. Now I read it to my niece a lot and she loves it too – she is 2! I’ve red this as a child and my little brother and its a really lovely book. The story is really simple, but really sweet for little children. Especially if they can talk, so they can read the story with you. A very fun and adventurous story. When I was little I would read it time and time again.Also lovely pictures. this is so good for the little ones. i like it to. adored this book when i was little, i would read this to any child 5 or under and i know they would love it. This book is the prefect family read, with amazing characters and a fantastic plot line, We’re Going On A Bear Hunt will stay in your heart forever. It is about a bear at the very last bit and peepul trying to find the bear. It was funny when the peepul said haa a bear and thay ran upsters. This book is a nice read with nice pictures and is great for reading to my 9 month year old. Classic story for young imaginations. 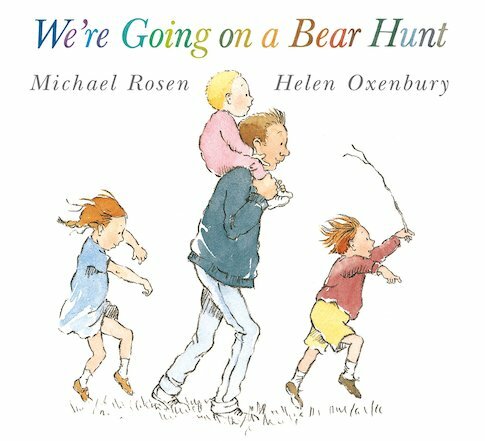 Very catchy …we play going on a bear hunt everytime we go on a walk by reciting the words from the book. I loved this book when i was little and i still love! I did like this book when I was younger. But, I find it’s a bit too repetitive as I’m older now and would be good for children aged 5-10 years. Once I read it, I had to act it out. It is fun if you act it out, but I feel I am too old for it now. It’s great as a play. But because it’s a short story, the next time you read it you know exactly what’s going to happen. I would recommend, but only for younger children to read. This is a great book to read and I have the bear to go with the story I love the sounds we can make when reading it and its just a great tale. I think it was not for me it is a bit babyish and boring it kept using the same words so to sum up it is the wost book I EVER read. I think this book is very good for 3-beond its really good. I love this book because how they suggested to get through long grass,river,mud,woods,snow storm and the cave.